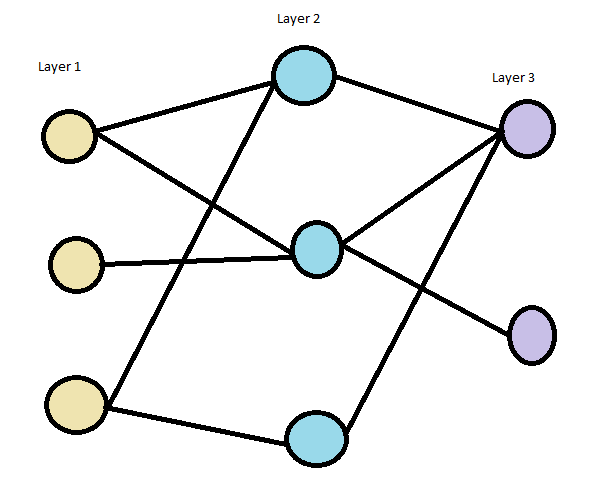 Essentially, it describes something like a neural network with adjacent layers being bipartite graphs. I am particularly interested in efficient algorithms to find some subset of vertices in layer 3 that are reachable through every edge from some input vertex in layer 1. In my example graph, the first vertex in layer 3 satisfies this condition for every vertex in layer 1. The second vertex in layer 2 satisfies this condition for the second vertex in layer 1, but not the first and third vertices. How to induce maximum matching and minimum vertex cover from each other in a bipartite graph? How to find the total number of connected Range Graphs which have n vertices on left and m on the right.